Big Sur and Yosemite National Park – two icons of the California landscape, of the West! And I had the tremendously good fortune to see both of them, back to back. The Esalen Institute on the Big Sur coastline no doubt lives up to its reputation as a kind of ‘secret garden’ in which the spiritual traveller, New Age reveller and those just wanting to ‘get away from it all’ periodically seek refuge and community. Compared to the Ojai Foundation, however, due to the large number of guests and limited space on the narrow strip of land that Esalen occupies between the sea and the mountains, to me it was less of a place for quiet contemplation and more one for relaxation, indulgence (scrumptious organic buffets! skinny dipping hot tubs overlooking the pounding Pacific surf below!!) and connection with my fellow workshop participants and the other guests. Never the less, the singing class I took led all who participated in it to a place of deep vulnerability, connection and healing. And a special encounter did afford me the experience of the famous synchronicity that Esalen is said to give rise to: Walking into the dining hall on the first night of my stay, I see a tall, blond young woman sitting at one of the tables who instantly seems familiar to me. Then I realize: She is the first person who ever told me about the Esalen Institute, during a chance encounter in a community garden in Berlin, a year ago! She had just returned from a volunteer stint at Esalen and while we were busy planting mint together she told me how much she missed the place and how unsure she was about whether she really wanted to stay and take up a job in Berlin. We both left our jobs, we both came to Esalen a year later – within two weeks of each other. She had returned to the place she felt deeply connected to for a six month internship, I – thanks to her – had decided to visit it for the first time. 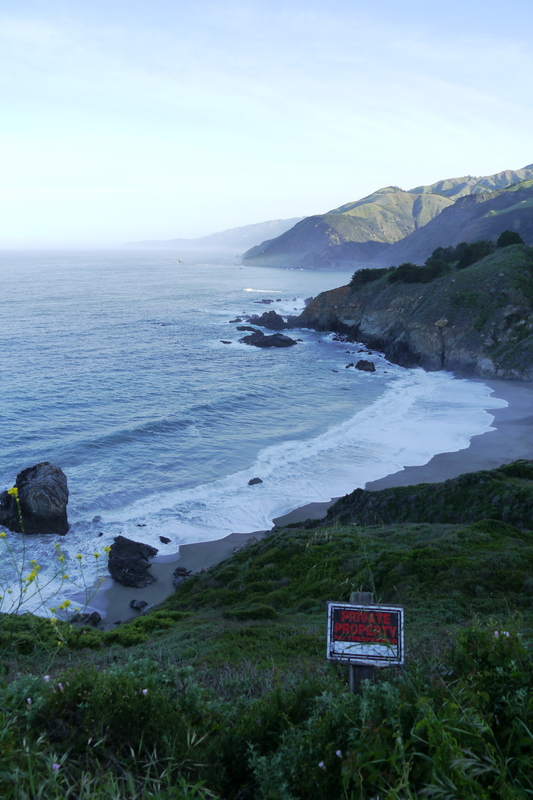 And I certainly formed a most wonderful connection to this place as well, if not to Esalen itself then certainly to Big Sur. I rented a car and spent two days driving up and down that famous Highway 1, hiking in Big Sur’s beautiful state parks, camping wild one night at the highest point of Los Padres National Forrest with a spectacular view of the winding, rugged coastline below. I thoroughly enjoyed coasting along that winding road, I could not stop marveling at the crashing, glittering expanse of the Pacific and when it was time to head on, I found I had become exceptionally fond of this tenaciously remote and individualistic stretch of the California coast.